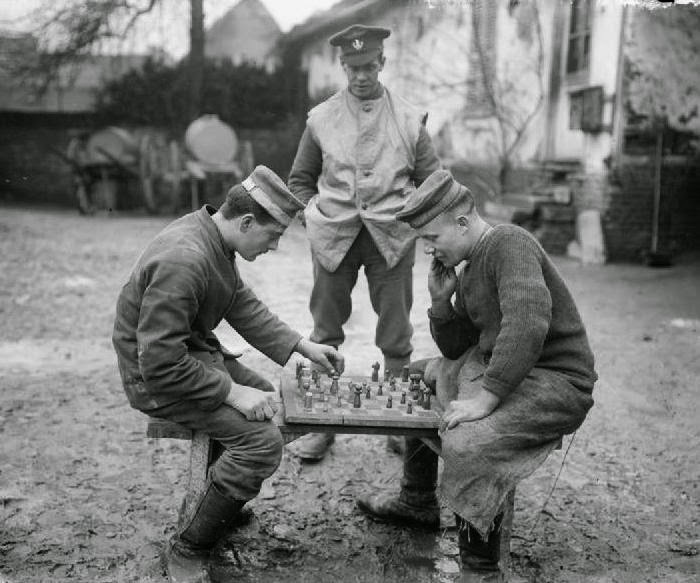 The final episode in this series on chess in World War 1 starts at another grim location where the game had a following: the prisoner of war camp. These were POWs - prisoners of war. But there was another kind of prisoner during the war: the prisoner of conscience. The conscientious objectors - 16,000 in the UK is the figure that crops up - varied in degree: from a refusal to take the lives of others (and who may yet have served at the front as medical aides or stretcher bearers i.e. in considerable danger), through to a blanket rejection of all war-related activity. Possibly this chess set was fashioned by one of those latter "unconditionalists" whose stand on personal principle cost them their liberty. © IWM Q103672 Mr Henry Smith photograph collection. Here is reference to another improvised chess set - demonstrating an abiding need to have one at hand. ...but we should applaud the sentiment anyway - and we'll come back to the significance of chess in the war at the end. In the rest of this final episode we'll count the cost of the War among chess players, and we begin with another game played under those "most adverse circumstances". It requires, as an introduction, a further re-telling of the appalling (though it would have been - if you take out the chess - commonplace) story that was given, said The Chess Amateur of August 1915, by The Australasia who had taken it from L'Italia Scacchistica. It was published "not because of any merit" in the game itself, "but because of the especially interesting circumstances under which it was played". After you have read it you may wonder whether that word "interesting" quite meets the case. Game played in the trenches. 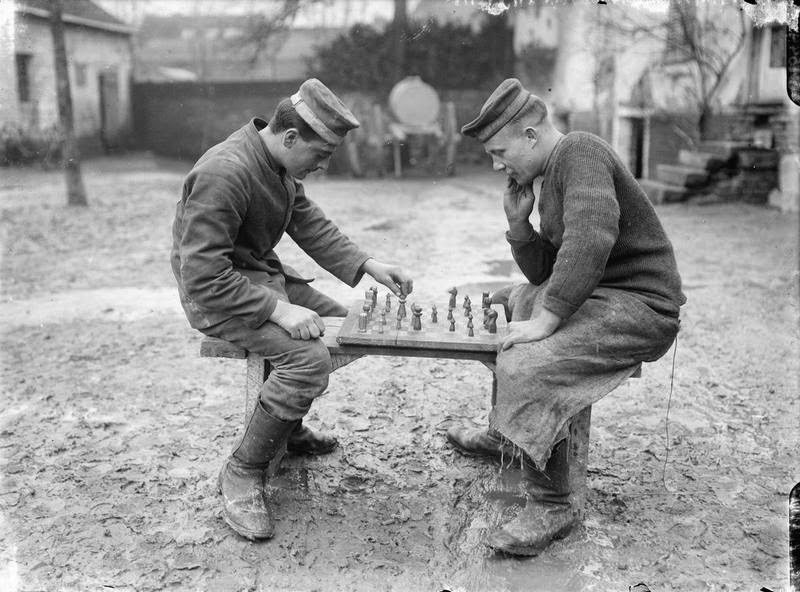 A. Vanoode, of Brussels, was stationed in one of the trenches in the neighbourhood of Saint George, and during a lull in the hostilities proposed a game of chess to a fellow enthusiast, a French comrade named Dussaaixe. 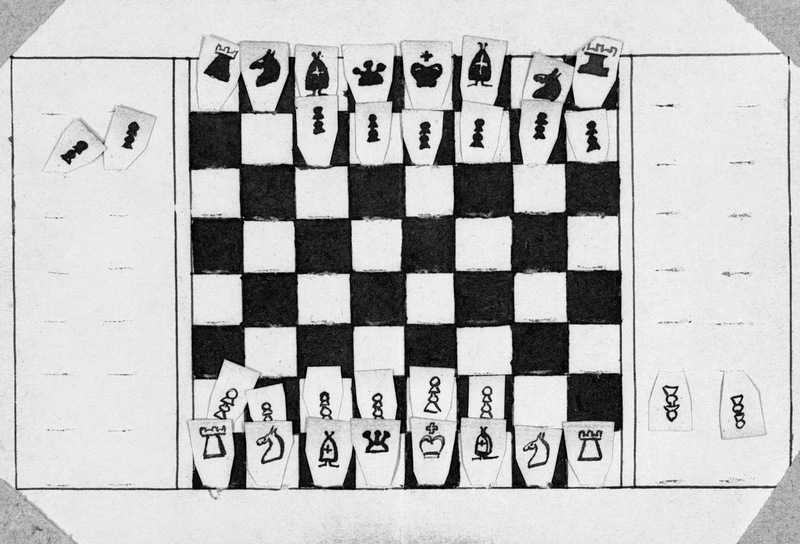 This was played upon a pocket chess-board produced by one of them, and proceeded without incident to Black's 17th move, when the sentinel sounded an alarm, and the discharge of artillery shook the ground. M.Vanoode at once made his way to his post at the extremity of the trench, M. Dussaixe calling after him "j'aurai vain....," but the sentance was never finished, for with a terrible crash a shell exploded in the trench killing him instantly. In truth, a tragic ending to the game. White was killed in a moment of victory, and Black lies in hospital dangerously wounded." The sinking of the Lusitania, torpedoed by a German U-boat in May 1915, claimed the life of F.G. Naumann (amongst other things a patron of the Monte Carlo Tournament of 1902), reported The Chess Amateur of November 1915. The last number of the 'Deutches Woenschzach' (dated May 23rd)...announces the death in battle of Dr. Fritz Tarrasch,...he had been twice wounded and even decorated with the Iron Cross...he was a fine chess player...the sympathy of chess players everywhere will go out to his famous father, who has thus been unhappily bereaved of two sons during the past eventful war. The Chess Amateur September 1915 quoting The New Orleans Times-Picayune. Friedrich Köhnlein, born 12 December 1879 was a German chess master and problemist. He drew with Alekhine and Nimzowitch and beat Yates in the 1900s. He died in the Battle of the Somme in the 5th July 1916 (Wiki. Games here). Canadian chess player Frank Percival Benyon had held his own against Marshall and Janowski, but volunteered - and perished as war exhausted itself in September 1918 (see this piece by Olimpiu Urcan). I am well satisfied. Ever since I enlisted I have been having the time of my life, and not once have I regretted the step that I have taken...It's a great life, and I would urge any eligible young man to come and join us. Personally I feel that ten years have been taken off my life. I have never been happier. M'Arthur would later be decorated for conspicuous gallantry (The Chess Amateur January 1918). ...The man's head is bare. He kneels upright, his fingers pressed under his arms. He is stiff. He is cold. He is holding himself in. The woman, covered, leans forward head and shoulders bent, swags of her robe dropping like tears. These figures are The Grieving Parents - monumental images of grief, but also of guilt and self-reproach for a generation which encouraged its sons to go to war. This cemetery, near Vladslo in Belgium ... holds the bones of 25,644 German soldiers. Each flat stone carries 20 names. The male figure gazes at the ninth stone, and the name of his son 'Peter Kollwitz'. The sculpture is by Kathe Kollwitz (1867-1945). Text is from Minds at War Episode 10: The Grieving Parents by Ruth Padel. BBC Radio 3, 4 July 2014, as transcribed by MS. The quote comes from Sgt. H. Allman, who'd learnt the game in uniform just three weeks previously: given by The Chess Amateur November 1915.